RapidComposer is a complete solution for music composers, both amateurs and professionals. It is a comprehensive software that offers you advanced tools for score composing or editing. With its preview tool you can listen to your creation as you compose it. 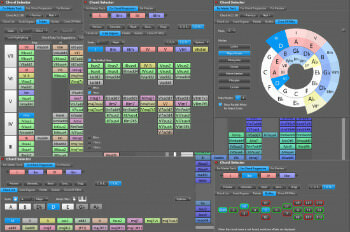 RapidComposer is a unique, non-destructive, phrase-based music composition software. – Easy chord entry from Chord Selector, Circle Of Fifths chart, MIDI keyboard, or computer keyboard. Chord Selector offers ‘Chord List’, ‘Scale Degrees’, ‘Palette’, ‘Chord Builder’ and ‘Circle Of Fifths’. – Piano roll with scale and chord notes shading, and smart arranging of overlapped notes in two styles. – Extensive scale, chord, guitar chord, chord progression databases. – Standalone and VST version (32-bit and 64-bit), both Windows and macOS. The VST version of RapidComposer is usable in DAWs that support VST plug-ins with MIDI output.